Lot 276, the French-bred Archetype, sells to Prince Faisal Bin Khalid's Red Stable for 335,000 guineas (US $448,794) at the Tattersalls Autumn Horses In Training Sale. 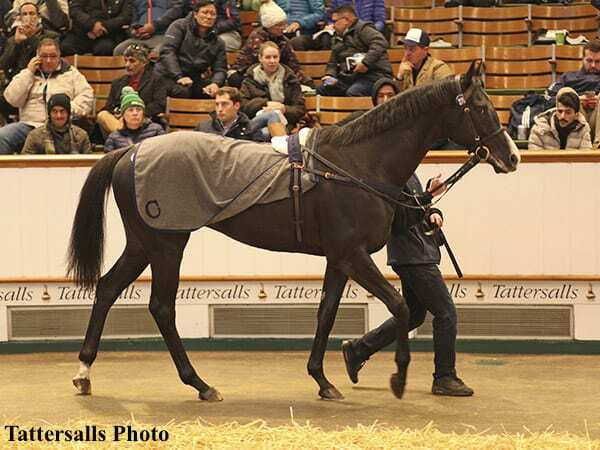 The Tattersalls Autumn Horses in Training Sale started solidly yesterday with an international cast of purchasers contributing to the strong clearance rate of 84 percent. The opening day was topped by the Timeform 110-rated Archetype who was knocked down for 335,000 guineas (US $448,794). The Tattersalls Autumn Horses in Training Sale is a major attraction for buyers from the Middle East and one horse headed for sunnier climes is Archetype. The Timeform 110-rated 4-year-old was purchased by Saad Bin Mishraf and Ted Voute on behalf of Prince Faisal Bin Khalid's Red Stable, the leading stable in Saudi Arabia. The King Abdulaziz Champion Cup, known as the King's Cup, is run in February and Jorvick, who was purchased by the same connections here in 2016 from the Juddmonte draft, finished second in this year's renewal. Archetype was consigned by Simon Crisford's Kremlin House Stables on behalf of Highclere Thoroughbred Racing's Wordsworth syndicate. The Tattersalls Autumn Horses in Training Sale has been a fruitful hunting ground for Australian trainer Chris Waller and his bloodstock agent Guy Mulcaster who today teamed up to secure Mr Reckless for 240,000 guineas ($321,490). Consigned from Jamie Osborne's The Old Malthouse in Lambourn, the three-year-old son of Reckless Abandon out of the Doyoun mare Zarabaya is rated 103 by Timeform. “He is exactly the sort of horse we are looking for,” reported Mulcaster. “We took a look at him early in the year and have been following his progress and we are delighted to get him. The Tattersalls Autumn Horses in Training Sale continues today. This entry was posted in Bloodstock and tagged Archetype, chris waller, Guy Mulcaster, Highclere Thoroughbred Racing, horse auctions, Kremlin House Stables, Mr Reckless, Prince Faisal Bin Khalid, Red Stable, Saad Bin Mishraf, Tattersalls, Tattersalls Autumn Horses In Training Sale, Ted Voute, The Old Malthouse in Lambourn by Edited Press Release. Bookmark the permalink.